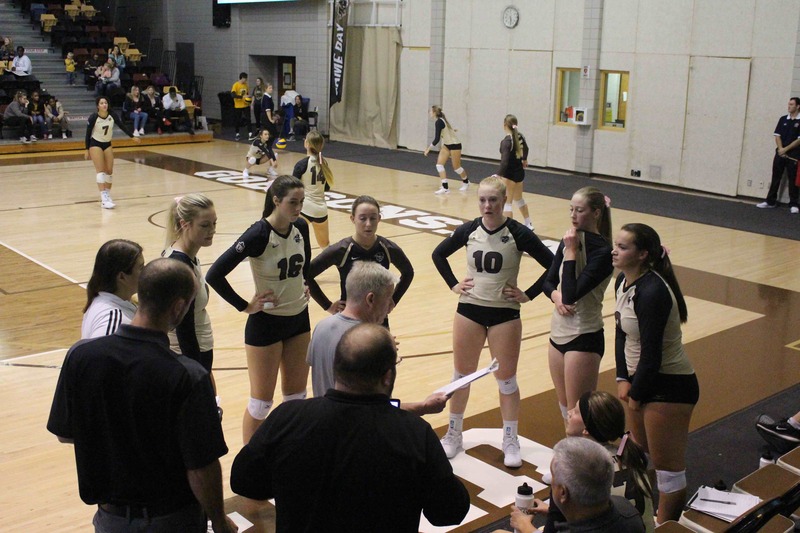 The U of M Bisons women’s volleyball club returned to the court to host the University of Alberta Pandas this weekend, losing back-to-back games to drop to 4-5 on the year. The Bisons fell to the Pandas 3-1 Friday at the Investors Group Athletic Centre. Kory White had a strong presence throughout the match and slammed down a game-high 19 kills for the Pandas. Manitoba was led by Laura Findlay with 13 kills and 15 digs. Cassie Bujan was heavily involved for the home side, tying Jenae Eisler of the visitors with a game-high 16 digs. The Pandas led 16-10 at the technical timeout of the first set and did not look back. With help from three service aces, Alberta took the set by a score of 25-17. The herd responded in the second set and got off to a 12-4 lead, which forced the Pandas into a timeout. White committed five attacking errors leading up to the Alberta timeout, the last of which was blocked by Bisons middle Grace Van Der Meer. Manitoba maintained its second set dominance and won 25-19. The third set was a gruelling battle from start to finish, with Alberta claiming a 26-24 set victory. Manitoba led 11-8 midway through the set, winning the extended rallies early on. The Pandas responded with six unanswered points to take a 14-11 lead. The Bisons kept pushing and evened the score at 24-24. The visitors composed themselves and White slammed down a kill, followed by a Van Der Meer attack error to take the crucial third set. Alberta took care of business in the fourth set — winning 25-17 — to take the game 3-1. “We had some makeable plays and we just didn’t make them and it cost us,” Bisons head coach Ken Bentley told Bison Sports. The bad luck continued Saturday when the Bisons were swept in three straight sets. The Bisons were led by Findlay’s 10 kills and 13 digs. Laura Hill played a big role for the home side as well with four kills and 12 digs. Julia Zonneveld led the Pandas with 17 digs, while Vanessa Jarman led with 11 kills in the match. Manitoba came out strong in the opening set and led 16-12 at the technical timeout. The Pandas responded with eight straight points to take a 21-18 lead. White finished the set with a block to give the Pandas the 25-22 set win. “That momentum really hurt us,” said Findlay. Alberta kept the momentum going in the second set, opening with an 8-1 lead. The Bisons battled back and a kill by Allison Alcock tied the game at 11. Findlay followed up with back-to-back kills, giving Manitoba its first lead of the set. The Pandas responded with four consecutive points to regain the lead and went on to win the set 25-19. In the final set, Alberta continued to slam down the ball and Jarman powered down three kills to help her team to an early 5-0 lead. The Pandas continued to dominate the final set, with a Zonneveld kill solidifying the win. “They hit some great balls and we just didn’t defend as well as we’d hoped,” said Findlay. The Bisons will be back on the road next weekend, in Calgary to face the University of Calgary Dinos. Game one is Nov. 23 at 7 p.m. CST and game two is Nov. 24 at 5 p.m. CST.